Integration of WebMail Pro 8 with ownCloud allows users to access their email accounts directly from ownCloud. IMPORTANT: This package does not install the product itself, it's assumed that webmail application is already installed on the same server where you have ownCloud set up. 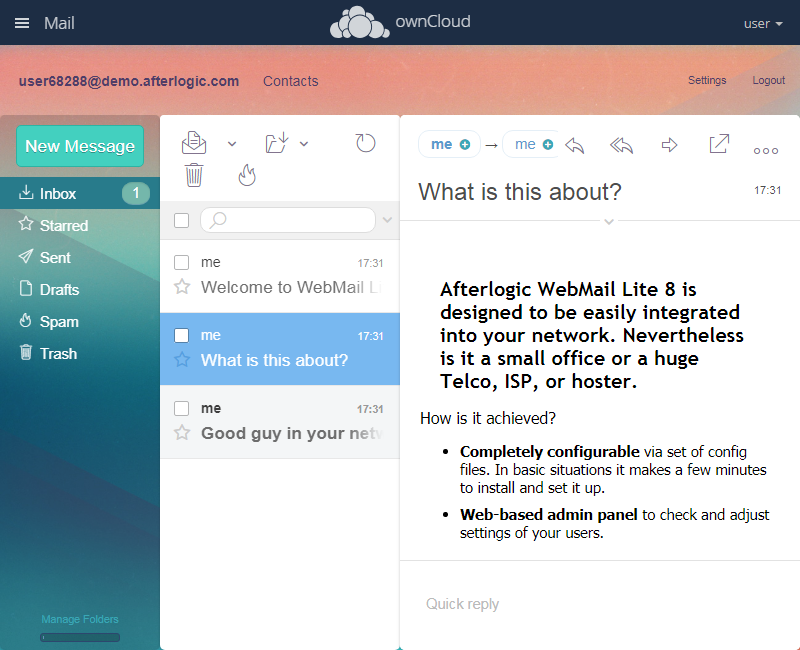 The scenario of running Webmail and ownCloud on different servers is supported as well. Note that ownCloud version 10 is required. * Alternatively, you can unpack the application package in the apps directory of your ownCloud instance. Then in Apps screen, Enable 'AfterLogic' plugin. In Settings > Admin > AfterLogic WebMail Settings screen, enter "Web URL to AfterLogic WebMail installation" and "File path to AfterLogic WebMail installation". Keep in mind that absolute filesystem path needs to be supplied there. If you install this on a shared hosting, you might need to check the filesystem path with your hosting provider. If you don't specify Path, it's assumed that it's installed on a different server than ownCloud. For this to work, set AllowPostLogin to true in data/settings/modules/Core.config.json file of WebMail installation (it's less secure than the standard integration method but it's the only way of sending credentials to remote server). The source code of this app is available on Github. If you have any questions or encounter any issues using WebMail within ownCloud, please feel free to open a ticket at the issue tracker. Thanks!